The next question is where this material came from. Odds are that it is a combination of stuff that had been in a moon that was disrupted and comets. The exact origin scenario isn't well pinned down. We don't even know when they formed. 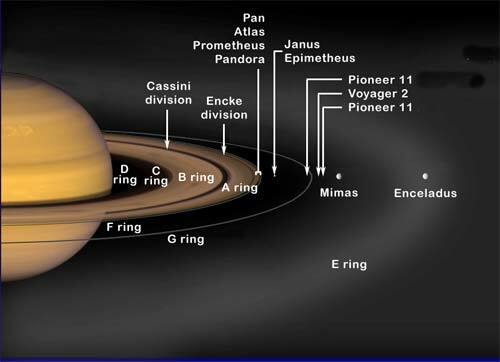 A lot depends on the mass of Saturn's rings, which we currently don't know all that well. Gravity waves give us a very good estimate of the surface density, and hence the mass, in the places those waves form. Mostly that is the A ring. Mass estimates based on linearly scaling up mass with optical depth would indicate that the rings have a mass roughly equal to that of Mimas. However, numerical simulations show that the correlation between mass and optical depth isn't that simple. So it is possible that the rings are as much as 3x more massive than Mimas with lots of mass basically hidden in the B ring. If the rings are only the mass of Mimas, they could very well be "recent", in that they formed in the last 100 million years or so and they would almost certainly be less than a billion years old. However, if they are 3x the mass of Mimas, they have to be primordial. It is worth noting that we should have an answer to the question of the mass of the rings before 2018. Part of the end of life mission for Cassini has it go on a highly elliptical polar orbit that will dip through the inner D ring, very near the surface of Saturn. The telemetry for the Cassini probe should be accurate enough to measure the gravitational pull of the rings during this maneuver, hence measuring the mass of the rings before Cassini plunges into the atmosphere and burns up.